The whole world is astounded and distressed at the incivility of American public discourse. Not since Senator Joseph R. McCarthy accused President Dwight Eisenhower, former president Harry Truman, and the late president Franklin D. Roosevelt of being Communist sympathizers, and General George C. Marshall of being an outright Soviet agent — these were in fact four of America's greatest leaders, in war and peace — have American politics been so vituperatively nasty. In the Vietnam and Watergate crises, there was room for spirited debate over whether to depart abruptly from Vietnam, stay the course, or fight the war differently, and over whether the president had committed illegalities in the complicated Watergate affair. And in the McCarthy era, almost all respectable people, once it had descended to the point of the extreme allegations mentioned above, were against the senator and for the president and his predecessors. In the Charlottesville melee, it is now clear that Mayor Michael Signer, a radical Democrat and close associate of Clinton campaign manager John Podesta, who early declared his city "a capital of the resistance" (against the constitutionally elected president), intervened for some protesters and against others, ordered the police to facilitate violence at times, and changed his previous support for retention of the contested statue of General Robert E. Lee to a vote for removal. It was obvious to him and to close Clinton insider Governor Terry McAuliffe that they could engineer a showdown between opposing extremes that had nothing to do with the merits of General Lee, but that could escalate the polarization in the country to the embarrassment of the president. It was a cynical exercise in political manipulation by very distasteful means, and has so far been partially successful. President Trump condemned the American Nazis and Klansmen who were most visible in support of the (rarely so abused) "right to speak," and he also condemned those on the other side, who came armed and prepared for combat. These were led by the so-called Antifa (anti-fascists) and Black Lives Matter, and members of both groups contributed to the violence. The one fatality was perpetrated by an apparent anti-black racist with his car, in an action separate from the rioting. There was absolutely nothing wrong with the president's clear denunciation of the violent factions on both sides. Because Nazis are chiefly remembered for what was probably the greatest crime in human history, and the Klansmen are the most odious domestically originated political movement in American history, fomenting hate of non-whites, Jews, and Roman Catholics (about half the entire population now), public revulsion toward them both is deservedly almost universal. What has occurred in the American public political debate in the last week has been insane, and has shaken the confidence of everyone who wishes America well as to the mental stability and integrity of the American political class. That the national media and both parties in Congress are alarmed by Trump's victory and aspects of his program, and are unconvinced of his durability, is in itself understandable, and has led to the false allegations that the president is a racist, a sexist, and a quasi-traitor who colluded with Russia to rig his election. This spiked momentarily a few months ago with widespread talk of impending impeachment (the absence of any evidence of the required crime was not noticed for a while), and now, unimaginably, he is accused of being a Nazi sympathizer. Racists David Duke and Richard Spencer approve of Trump's attacks on Antifa and BLM, which the media take as confirmation that Trump is one of them. The most egregious charlatan in America, Al Sharpton, wants to rename the Washington Monument. Trump's formerly most respectable critics are now clay in the hands of this riff-raff. Madness is in the air, like a virus. The New York Times declares Trump's sponsorship of Nazism on the front page. My former colleague at the Jerusalem Post, Bret Stephens, wrote last week in the Times that American Jews were now endangered by Trump's anti-Semitism. Other highly intelligent and cordial acquaintances of many years routinely utter insane opinions, and often vile slanders: Charles Krauthammer declared it "a moral disgrace" for Trump to condemn the left-wing violence in terms similar to those with which he condemned the Nazis and the KKK. Bill Kristol accused Tucker Carlson, for no reason, of being an apologist for slavery and an anti-Semite. These pearls are representative of that formerly distinguished group. I know the people mentioned to be intelligent and decent, but I don't know, even after speaking with some of them, why they have taken temporary leave of their senses. Falsely accusing someone of Nazism is morally equivalent to being a Nazi sympathizer; it is to this pitiable state that the country has been reduced. The president suffered the cancellation of a lot of events at his Palm Beach club, Mar-a-Lago, but his position in most polls rose slightly in the week, showing how isolated from the country the national media are. Mr. Trump must rally the whole country against violent extremism of all kinds. Ninety percent of Americans would approve the message and are ready for it. This would enable hysteria to subside, and establish the president as the leader of civilized discourse and not, as his enemies, including those in his own party, have claimed, a threat to it. 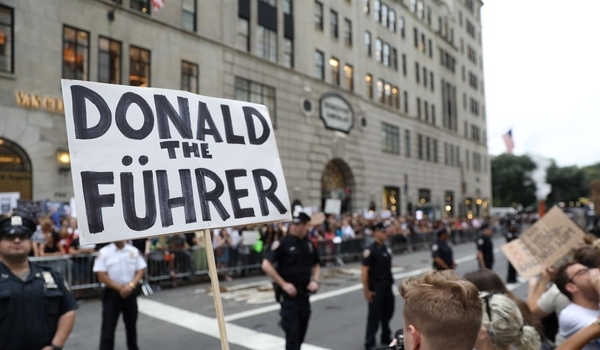 (It was outrageous for Senate majority leader Mitch McConnell to tweet last week that "there are no good Nazis," as if that contradicted the president.) The congressional Republicans have failed so completely because they opposed Trump's nomination, did not believe he would win the election, and still aren't convinced that he has any staying power. Trump can take the headship of national opinion, calm the country, make a politically opportune pact with the Republican congressional leaders to put through tax changes and infrastructure improvements that will be popular with most Americans and spur economic growth, and take it from there. But the madness must end, and the resumption of serious and effective government, after a lapse of many years, must resume, now. The president can do it, but only he can do it. His fine speech Monday night was encouraging. That's what good presidents do for a living; they lead.